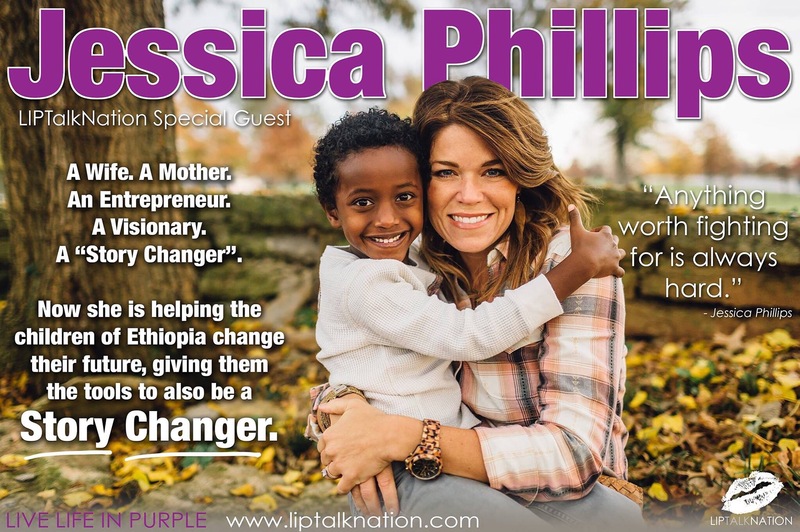 I’m not sure about you all LIPTalk Nation, but this episode with Jessica Phillips has been resonating with me so much. It seemed like everything she said was a valuable tip. I hope you all take good notes. It’s so easy to want to throw in the towel and I believe most people do to soon. Most of us want things to be easy; and for me, most things do come easy for me. So, when it gets difficult I want to quit. What stands out to me right now, is from an early part of the episode where Jessica states, “Anything worth fighting for is always hard.” Something clicked inside of me when she said this. I became a little stronger, emotionally stronger. You see, I’ve been fighting for YOU, LIPTalk Nation. I’ve been fighting for ME. Too many of us have stories to share; stories that can help someone heal and stories to that can UNITE a community of people to start a Confidence movement. We all need to share our stories instead of gossip and put down each other. I don’t have time for that nonsense. It is people like Jessica, that inspire me to BE MORE. She’s a wife, mom, entrepreneur and philanthropist. Living out her calling. God gave her a vision after she adopted a little boy from Ethiopia. Her son had rickets (which is softening of the bones) due to lack of nutrition. It was out of sheer curiosity to give him Moringa Oleifera (the most nutritious plant in the whole entire world) to try; and in 24 days he no longer had Rickets. That inspired Jessica to do more for orphans in Africa. She knew that Moringa thrived in third world countries and wanted to help as many orphans as possible with this nutrient rich plant. She set her mind on a goal to help orphans and that’s how Moringa for Many was started which is now known as “STORY CHANGERS”. I asked Jessica how she balanced her work life and family life and she gave some really great tips. But the first thing I remember her saying is that it’s still a process. She makes sure that she sets time for herself and gives God the first part of her day; Which is something that I struggle with. Many of you may struggle with the same thing, especially being a mom. We think we are supposed to put family first before ourselves and I think that’s the wrong mind set. Eventually, we run out of energy if we don’t make time for ourselves, let alone give time to God. I know that there is a mind set of “if you are doing something for yourself or loving yourself” than it’s pride. I wish this mind set would go away. I think it has gotten a lot of us in trouble. Because we end up saying things we don’t mean, or yell at the kids or even our husbands when we are so exhausted giving all we can. Jessica really points out that we need to make sure that mom time and business time don’t mesh together. Even when it comes to answering a text message at dinner. I am sooooo guilty of that. Like I said, everything Jessica said was a valuable tip. I almost teared up though when I asked her if she ever felt like quitting or thought she wasn’t good enough. Her answer was an eye opener for me. She said “Every day”. “What?” I thought. Here she is a successful mom, entrepreneur and philanthropist and wants to quit every day? If you listened to the episode than you heard why she feels like it. She mentions how hard and difficult it is to help orphans in Africa. It took TWO years just to open up a preschool. So, it’s not as easy as people think to help third world countries. I didn’t realize that there would be so much red tape. But, Jessica’s example of persistence and obeying the vision God gave her is paying off. “Sometimes you don’t see the fruits of your efforts in the beginning”… that’s another thing that stands out to me. How many of you are an “I want results now” kind of person? I know that I’m like that most of the time. God has been really teaching me to “Be Still”. In fact, I just wrote a song about this. For those of you who know me, know that that is the hardest thing in the world for me to do. But, It has been a beautiful lesson which requires faith. That is what I see in Jessica. She has the gift of Faith. She never thought that she would be a business woman let alone a speaker. Jessica has definitely learned how to define her own terms and expectations for herself. There is a huge need to change the stories of orphans in Africa. My heart is aching for them. I hope you all get a chance to listen to Jessica’s episode. I believe your story just might change, if you do. Anything worth fighting for is always hard. Set your mind on a goal and stick to it. Sometimes you don’t see the fruits of your efforts at first. It’s okay to want to quit, but the important thing is to not quit. Don’t throw in the towel to soon. See… So much value here. Not to mention that the Moringa that Jessica used is Zija’s moringa. By the way, it was a life changer for me as well. But again, that for a different day. I hope you have enjoyed this post as much as I did writing it. I love to see ordinary people do Extraordinary things. To find out more about Jessica visit thestorychangers.org or sharethefeast.org to set a place at your table this Thanksgiving for an orphan in Africa.